One of Boston’s all-time favorite Irish politicians was Dapper O’Neil. With a name like that you know there had to be a lot of rakishness in the man. One thing that always struck me funny about him though was his relationship with Helen T. Skrzowski, his girlfriend of 56 years who died at age 91 on December 14, 2011, almost four years to the day after Dapper who died at age 87 on December 19, 2007. I could never figure out how a guy could have a girlfriend for 56 years. I would have thought at some time during that half century plus he would have felt strong enough to her to commit to marriage. In my mind Dapper was an odd duck when it came to that relationship. All I could figure was Dapper’s mother once told him he could not marry a Polish girl and that held him back. Now we get a new Boston Mayor Marty Walsh and what do we have; a guy who has been in a relationship with a woman for nine years. How does that happen? Isn’t there an expression “make an honest woman out her” that used to be said to guys who hesitated when it came to fully committing to a woman. The woman in this relationship is Laurie Higgins who grew up in Savin Hill and attended Saint William’s Church and played for the church in its CYO games. (I also had that honor. I played guard on the basketball team. The other guard ended up playing offensive line for the Baltimore Colts in front of Johnny Unitas.) It seems that Walsh cannot use the Polish excuse when it comes to her. Trying to figure out what was going on I did some research and read a nice story about Ms Higgins. This helped me figure out the reason behind the long relationship. The mayor has said that she is his best friend and the love of his life. That certainly shows he is interested in tying the knot. But Ms Higgins demurs and says she’s not of a mind to do it. Most people could not figure out what is going on but to me it is clear. Mayor Walsh had the misfortune of not coming from Savin Hill. He grew up in Saint Margaret’s parish which was the next one down from Saint William’s as you headed down Dorchester Avenue toward South Boston. If you grew up in these neighborhoods as I did then you know that the folks from St. William’s always had a low opinion of those from St. Margaret’s. Us Savin Hillers believed it was all right to hang around with the St. Margaret’s people or even date them but you would never want to commit to one for life. I guess the best way to understand this was that St. Margaret’s was considered on the other side of the tracks. It is easy to see why that was. St. Margaret’s was neither here or there while St. William’s had its own beach, tennis courts, ball park, yacht club, marsh and what we called the woods a vast playing ground with hills and trails and an astounding view of Boston and Squantum where the Navy Airbase once sat. Over the bridge we had parts that were quite fancy for Dorchester neighborhoods having houses similar to those you would see on Jerusalem Road in Cohasset. Red Lydon’s story will give you an idea of people from St. Margaret’s. He hung around with us at times. He told us he was going to join the Marines. We had a big party for him on Friday night since he was shipping out for Parris Island early Saturday morning. We dug deep in our pockets and gave him a decent bit of change as a going away gift. Despite being under the weather, early Saturday morning we went to South Station to see him off. He stood there with his suitcase, shook our hands, and got on the train as it was pulling out. Red never did join the Marines. He got on at South Station and off at Back Bay. He never gave back the money but it was a long time before we let him hang around with us again. You can understand why Ms Higgins will not commit to the mayor because of his background. He did move to Savin Hill to be closer to her but he’ll never be a true Savin Hiller. Even so, I would suggest to Ms Higgins that the guy isn’t a typical St. Margaret’s type, he did after all get himself elected as mayor. Maybe that makes up a little bit for the misfortune of his youth. How about giving the guy a break?. Make an honest man out of him. Forgive him his background and lead him away to some quiet place and bestow upon him the honor of saying he married a Savin Hill girl. * Jsck Cantwell … may he RIP … I gave the old rogue bachelor from Union Square’s eulogy at that church right in Union Square, in 2000 as cancer took him. Lotta great talks, lotta confessional soul searching to me from Jack about a particular Irish girl he … more or ledd 🙂 …left at the altar. We took a company break one day for Jack to see his lawyer, change his Will, and leave her all his ..
considerable … worldly chattels. She was in the first row, a very lovely old gal with still plenty of looks to enjoy this unexpected fortune. I suspect she was always a very honest woman anyhow, but in any event …. Have you ever seen Virtue absolutely … Glowing ? !? It has sweeping serpentine uphill streets where perch old manses with, grounds. These streets are sentineled by very old trees. My Son, John, was born at St. Margaret’s. It is gone now. It was a highly acclaimed hospital for Mothers giving birth. Matt. I left this comment in another post but you hadnt responded. So John Connolly wont be getting out of jail anytime soon? 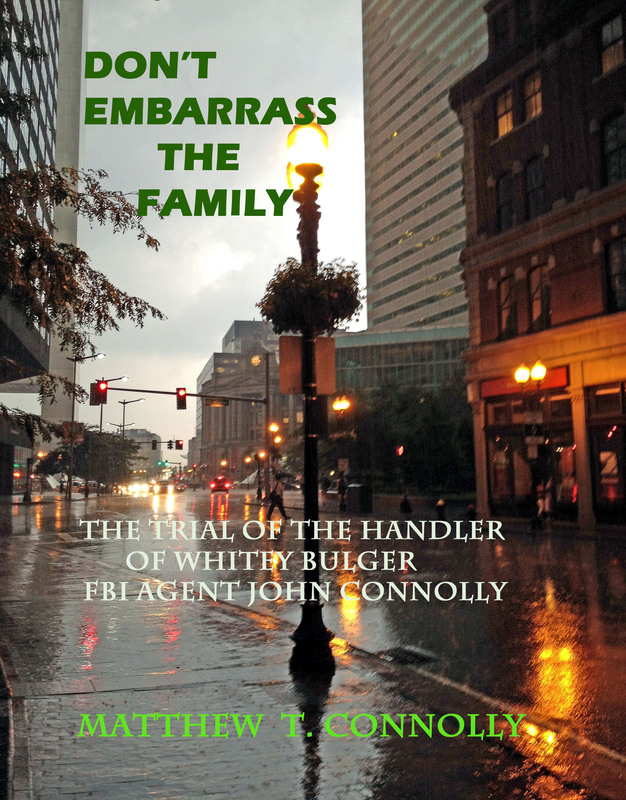 Am I correct in that John Connolly chose not to testify at any of his trials and thats a main reason he got convicted? On a side note, do you know the addresses of the following? 4. Any significant addresses in the Charlestown and Somerville and Roxbury area regarding Winter Hill/Bulger/Flemmi. There is a T-Stop right across the street. It’s a Starbucks and a sushi bar now. The Burger King is at the D St. intersection now. John Connolly did not testify. That is not the reason he got convicted. In the Boston case it was found by the jury that the most serious charges were nit proven; the minor charges were but he was sentenced as if the major ones wer. Can’t help you on the addresses. I’m on the road and those records are elsewheres. Please tell us the name of the other on your CYO team! Danny Sullivan – an Irish Ukrainian from Saxton Street right around the corner from Belfort.